As many of you know I was on TLCs Extreme Couponing All Stars show (known as Season 3) in addition to my first appearance on TLCs Extreme Couponing season 1. I am calling this video My Extreme Couponing All Stars Shopping Trip because it was the second show on TLC that really showed the massive savings possible when shopping. During this new video I share with you specific tips and secrets I use that you may not have heard before — these tips will move you into being an Extreme Couponing All Star too! Most of these deals you will be able to snag at Target this week, this shopping trip was just a couple of days ago with current deals. See the list of Top Target Hot Deals to see a few more details. What are your secret savings tips? I shared a few of mine, do share yours in the comments? Just coming back home and want to quickly share some of the deals I picked up today at my Smith’s store (Kroger) You can get some of these deals too! I will have a couple more posts later in the day today about some other deals that you can get, and they don’t expire for awhile– so check back! The picture does not show my entire shopping trip. Spent $54 and Saved $64. I had grapes and bananas, and more items including 4 Pillsbury Frosting (using a coupon that came in the mail from the company). 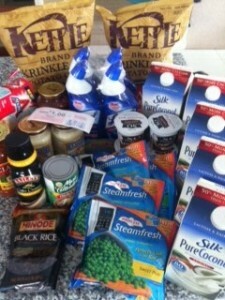 Some items I bought had no coupons!! (That statement pains me to type)!! It is a rare thing for me to not use coupons but a few deals I didn’t want to pass up while I could get them and no coupons are ever available anyway! — Bakery clearance Wraps and Bagels, Rolded Gold Pretzels ($2 each) too. Using the Save $5 when you buy 5 participating items promotion. The top price is showing after the $1 per item discount. — I picked up only one because Hazelnut was all that was left. 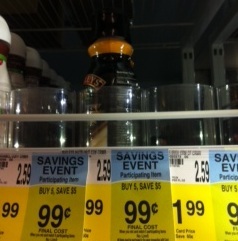 It saddens me that we have a group of local shelf clears promoted in Vegas, but what do you do! Final Price: $1.99 or $1 each! Final Price: net price $.69 each!! This is a good summary of the coupons and deals I picked up. Did you go shopping and save a bunch of your hard earned bucks this week? What deals did you find? Yesterday I shared the Walgreens PowerBars Deal. I went to the store and confirmed it’s even better by using the $1.10/5 PowerBars any or 1 multi-pack Protein Plus bars coupon! The PowerBars coupon scanned right through and the cashier and I carefully read the wording to make sure it was a match first! 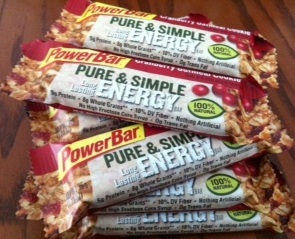 The reason the PowerBars coupon works is because it’s $1.10 of ANY PowerBars OR Protein Plus multi-packs. The key is the wording ANY for the single PowerBars! Here’s how to work the deal. Final Price: FREE + $0.13 Money Maker!! ** The printable is no longer available, sorry! I try to alert you to hot coupons to print & deals coming, so hopefully you are printing them when I share the coupons! = A net out of pocket of only $1.99!! and have 12 Powerbars AND 4 Right Guard Deodorant!! 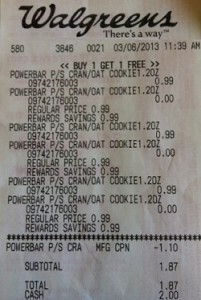 In the end you would have a net OOP (out of pocket) of $2.73 total and all for 12 PowerBars, 1 Softscrub and 4 deodorants! Had you walked in and purchased these items on sale but no coupons etc, you would pay $26.37!!! Learning to roll the items, sales and deals will drastically improve your budget!! Be sure to check out all the other Walgreens deals for this week and you could do even more deals! Here are the details about getting your free pastry at Starbucks going through 3/3/13! And then I walk through my Target shopping day for my coffee deal plus I found some great clearance items. Come along on my shopping trip to Target with Mr. Cameraman (and my mom) in tow.